Happy New Year! I’m starting off 2016 with an in-depth look at what I have so far in Light World. So far, it’s had a long, bumpy history going through many hoops and genre changes, but now, I’ve developed it enough to start talking about it in detail. I’m expecting to have video footage to show off sometime around March as I’ve been spending most of my time working on core mechanics. I previously posted this blog on Galactic Crucibles Wiki, so here is the Krayfish Entertainment version. 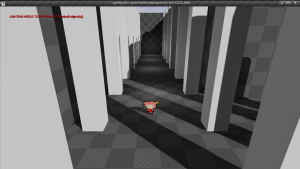 Project: Light World, or just Light World, is a fantasy RPG being created with Unreal Engine. It will be set in a three dimensional world with 2D sprites, sort of like Paper Mario. The goal of the game is to tell a compelling narrative and to create a vibrant, interesting world. I haven’t decided on whether or not it will have relations to the Omniverse Nexus since I don’t want to be too constrained by existing continuity, but we’ll see – it may be a wise choice for the future to give some extra content to the external site, and to possibly lay the ground work for video games based on other Nexus settings. I can see it fitting into the Last Hollows setting if we do decide to do this. While I don’t have a narrative yet, I do have a general idea as to what sort of direction I want to take it. That’s where I’ll need help the most. There are a few other positions that need filling such as 2D artists and 3D modelers, but those will come later after I have a prototype. Because this game will be story-based, the narrative will play a critical role in the type of gameplay to expect. The new turn-based combat system. The game will have two playable modes – an overworld, exploration mode where you can wander freely in an open world, and a battle mode – where bumping into an enemy on the overworld initiates a battle. The gameplay is similar to Final Fantasy’s turn-based system, but with a unique spin. With your four playable heroes, you can choose who you want to attack whenever you want as long as their attacks are ready. The attacks themselves are all magical in nature – they are closest in behavior to the way Pokemon moves or Final Fantasy spells are. They cost MP to use, although because they are the primary form of attack, if you run out, you’ll have to wait in real time to recharge giving the enemy plenty of opportunity to attack. 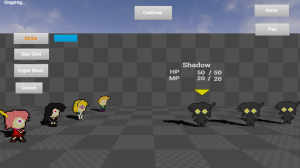 I have yet to program the leveling system, but I’m planning to have all the characters level up as a group just to avoid having characters drastically different in power from one another. That way, they are all equally useful, and battles would be more about proper strategy rather than just grinding out your weakest team members. Also, with the way I have the current battle system set up, there’s really no limit to how many party members or enemies can be out at a time aside from what can fit on the screen. And on top of that, party members and enemies share the exact same base class (only a single boolean variable determines whether the character is an ally or enemy) so while I didn’t actually intend it, a result of this programming is that you can have enemy characters in your party although I’m not sure I want to go that route. Even so, the system I created should be flexible enough to allow for some potentially wild setups. The setting of Light World is a dream-like purgatory for lost souls. It’s a very bizarre, magical place filled with strange inhabitants such as living toys and cartoonish monsters. Alice in Wonderland, Tim Burton and Fantasia are my primary sources of inspiration, and they serve as references for the overall atmosphere I want to establish. There’s a certain storybook aesthetic to it as well given the graphical style I’ve chosen to adopt. While I have general character designs and sprites for all of these, I am willing to make changes to them to suit the story. Of all of these though, the character of Amie has the most animations completed, so naturally I’ve developed her character the most. Amie – Amie is a young girl that fell gravely ill. Her soul was whisked away to Light World while her body was left as a vegetable, and her parents are desperately trying to keep her alive at a hospital for as long as they can. Amie is a normal girl who wants nothing more than to just wake up although over time, she begins to enjoy the fascinating, dream-like world. Of all the protagonists, Amie is the most human and normal, while the other party members tend to be a bit quirky and odd. Character and personalitywise, Amie is comparable to Dorothy from Wizard of Oz or Alice from Alice in Wonderland. Bella – Although human on the outside, Bella is actually a member of a species of shapeshifting demon that devours souls to gain the ability to take their form. She consumed the restless soul of a teen girl who tragically died and took on her appearance. However, upon the soul’s consumption, Bella gained a greater understanding of the victim and chose not to absorb her essence fully. The girl’s soul and the demon coexist as one, learning from one another much to the dislike to other members of Bella’s species who ostracized her for this practice. Charlie – I haven’t figured out Charlie’s backstory yet, but she’s going to be very technical and mechanical in nature having a fascination with machines and contraptions. And she might be slightly delusional as well. For the villain, I want to have some kind of underlying threat throughout the entire game. You should feel his presence almost everywhere as a looming threat and perhaps the biggest thing – play to the primal fears and phobias so that when you finally defeat him, you feel like you’ve conquered something. Antithesis – A manifestation of utter negativity whose source of sustenance is the suffering and torment of souls. When it attacks worlds, it creates distress and fear in order to prepare it for consumption. The most bountiful, filling souls are those whose last thoughts are complete despair with no positive thoughts whatsoever, and then upon their consumption, their consciousness ceases to exist leaving behind the raw, negative emotions to be absorbed by the entity. As such, the people of Light World try to remain a sense of hope in order to ward of Antithesis. For this guy, I’m borrowing a bit from Chernabog from Fantasia although I may change things up. I’ve even thought about having this guy be an avatar for Suntsitzeagal from the Omniverse Nexus. The main limitation I have is manpower. This is practically a no budget game, and I can only really work on this on my spare time just like the Nexus. Of course, if there’s interest in the game, it’s all the more motivating. Also, as of now I don’t want to go too deep into any online components such as multiplayer in favor of a more straightforward, traditional single-player game. Also, I haven’t decided what system this is going to be for. I’m debating between PC and Android, but in the end I may do both. I’m still exploring what’s possible to do in Unreal Engine although I don’t really see this as a game being ultrarealistic when it comes to special effects. At such an early stage of development, what I need the most help with is the narrative. I’m looking for story ideas that can help shape these characters and flesh them out. It will lead to game mechanics that can seamlessly integrate into the plot. Anything from backstory, main plot to tiny little lore bits would be most helpful. And of course, any and all feedback is very useful.